gift CD – Learn Picasa and Google Photos! 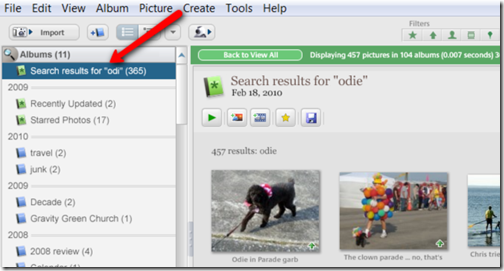 Picasa Tip: Backup or Gift CD? What’s the Difference? Picasa has the ability to burn your pictures to a CD or DVD – a DVD is simply greater capacity – all from within Picasa. You don’t need any extra steps. But wait! There are actually 2 ways that Picasa can burn your pictures to disc. The purpose of a Gift CD is to give all your pictures to a friend. You want your friend to see the improved pictures … *after* your edits. So the disk will just contain the Exported file of each picture. You also have the option to Export the pictures in a smaller size. Backups are intended to be insurance that you will never lose your original pictures. Picasa burns to disc your originals, even the ones in the Picasa Originals folders, along with all the picasa.ini files with hold your edits. When you restore using a backup made with Picasa, you are completely back in business with all your edited photos and the ability to undo every edit back to the original. The lesson is … don’t use Gift CD for your backup. Unless you don’t care about having your original pictures and the ability to undo your edits. She was afraid that she had to use Windows and find all the pictures all over again, copying them to CD as she went. She could have exported the album to another folder, then used Windows to burn that folder to CD. But Picasa can do the entire job, if you know where to look. Picasa actually makes it very easy to copy pictures to disk, but you won’t find it listed in quite the way you might expect, so a lot of people miss it. There are two ways to copy files to disk and both are available on the main menu. Same start – select the desired album, then choose Create, Create a Gif CD, and Picasa will burn your edited pictures to the CD or DVD in your drive. Picasa will complete the entire job for you, burning the CD or DVD. The only difference is that, with Backup, you’ll have your original pictures plus any edits. To see the photos as edited, you would need to restore and work with the photos using Picasa. Using the Gift CD method, the .jpg files on the disk will be the edited versions – just as if you Exported them. Picasa makes it nice and easy to burn pictures to a DVD with it’s Gift CD feature, but that DVD will only play its slideshow in a computer, not in a TV or standalone DVD player. That’s because Picasa is creating a data DVD, not a video DVD. If you want to be able to play it in a TV, you need to use some other software. 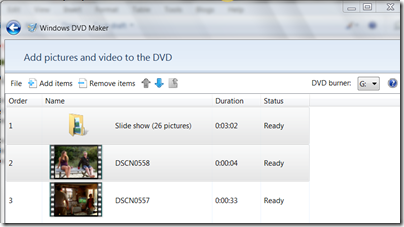 Windows DVD Maker comes free with Windows Vista, or Windows 7. 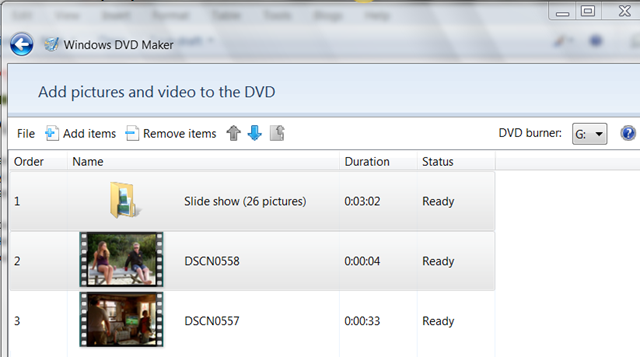 Just click on Start and type DVD – you should see Windows DVD Maker in the list and you can click on it. In DVD maker, you click on Add Items. That takes you to your file system where you can find ‘My Pictures’ and select whatever pictures you want. All the pictures you select will be added to one slide show. Any videos you select will become separate items on the DVD. Realize that this is using the picture files on disk, they won’t include your Picasa edits unless you saved those edits to disk. My preferred method is to Export all the photos to a new Folder, then it’s easy to select all pictures from that folder. They also won’t be in your custom order, they will be in the order that they are on your disk. See the article on keeping your pictures sorted. When you have all the items added, you may want to change the disk name and/or change some of the options before clicking Next. The question mark in the upper right is the help menu – read thru that for the complete process. On the next screen there is an option to add music to your slideshow. When you’re done customizing, just click the Burn button in the lower right. You should use DVD-R or DVD+R. DVD RWs work in fewer players. You may need to research the particular requirements of your player. See this informative website on DVDs and DVD players. The resulting DVD should play in either a computer or a DVD player. If you use Picasa’s ‘Movie’ feature – you will have control, in Picasa, of the slide order and the music. The result is a .wmv file. Then use your DVD maker to put that wmv file on a DVD. If you want to narrate your slide show as well, we highly recommend the free program from Microsoft called Photo Story 3 (Windows only). See the Geeks on Tour Photo Story page for more information. You can include more folders or albums by clicking the ‘Add More…’ button. When you’ve selected all you want, click Burn Disc. The resulting CD will have all the pictures – the edited versions – and it will automatically play a slideshow after being inserted into a computer’s CD/DVD drive. Now, here’s the really cool part … temporary albums. Any time you search for something the search results can be shown as a temporary album. With the temporary album selected, you can play a slideshow, create a collage or a movie with all the pictures in the temporary album. You can also Export, Upload, Email, Shop, or anything you can do with pictures in the selection tray. One thing you cannot do with a temporary album is create a Gift CD. But, not to worry, you can simply create an Album from the pictures selected in the temporary album. After burning the Gift CD – you can simply delete the Album you created.